east side bride: Dear ESB: Is my dress too costume-ish? I have a bit of a sinking feeling sending this along, but give it to me straight. 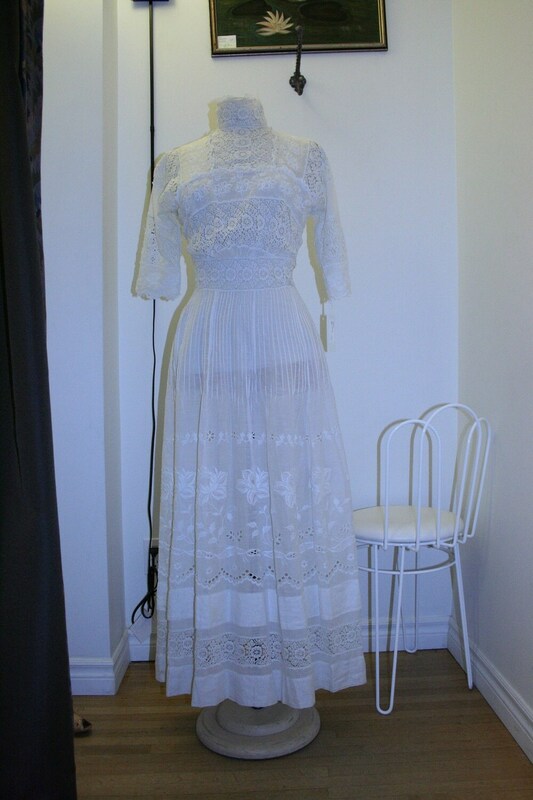 I recently picked up this dress as a potential wedding gown; it's from 1910, is in incredible condition and fits perfectly. Given that I'm going for a vintage/DIY wedding vibe, I was thinking that with some hip accessories I could pull it off. That said, I'm starting to have doubts. What do you think: too costume-ish? And if not, any hair/jewelry/veil suggestions to bring it into this century? My brutal honesty got me in trouble last time. Fortunately, I think your dress is gorg. This dress is stunning. If you are still feeling like its too costume-ish after adding your barrette a-la-Rodarte, you could always make some very small alterations to give it a more modern feel. This would require you messing with a museum-worthy piece, but if you brought the neck line down a bit, removing the high collar, I think you would eliminate the more "period" features that could make you feel like you are wearing a costume instead of a wedding dress. Although I think many brides end up feeling like they are wearing a costume, even in a contemporary dress....haha. I think it would look more chic on than on the stand. I'm thinking hair up, love the barrette idea and even some light bracelets. Especially if you have some stunning flowers. It would look so elegant! Beautiful dress! I vote for a colored slip underneath. It could be bright or pale, which would give it a contemporary twist. And then go minimal for the rest of your accessories and shoes. Less is more. I suggest a very messy up do, a little black eye liner and bright red lips. Red shoes too. I like red shoes. i second the bright red lip and messy updo. i'd also tangle a cameo or two (with chains) in my hair, were i you. congratulations on the lovely dress! I would love to see a picture of this on you, or at least full length. I have a feeling, like Carpensm, that this doesn't look as good on a mannequin as it would on a person with the right body type. This is the kind of dress that will look freakin amazing on some, and dowdy on others. I think the right hairdo and accessories will really help to avoid reminding people of their grandmother's nightgown. The messy updo idea is right on the money. Bright lipstick and rosy cheeks with subtle eye makeup will keep the whole look youthful and fresh. And don't forget fantastic shoes!! And this should go without saying but make sure the rest of your wedding party matches the vibe your dress has....you don't want everyone else to look ultra modern and polished if you're going with this lacy vintage romantic look. I think you're going to totally rock it, though! Go for it! Ooo love the idea of a coloured slip with it (although it seems like it would love a pale pink or even dare I say it peach?). Then yes to the red lips, peach cheeks and much messy hair. love the dress. but keep the hair and accessories modern or you will look a bit costume-y. i would do lighter, more natural make-up and messy hair with crazy shoes. that dress is killer. as long as you don't do your hair little house on the prairie style, it won't look costume-ish at all. personally, i would keep hair and accessories simple. let the dress stand on its own. I've seen these kinds of dresses referred to as tea dresses, and I considered going this route for my wedding, but didn't find one with the right fit and condition. Congrats to you on your treasure! Good luck! Would love to see the end result! that is such a great photo collection of brides wearing vintage, if not antique, gowns!! wow. 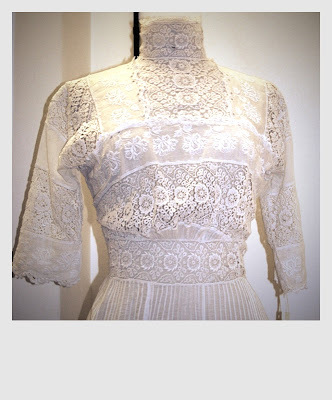 I am also wearing a 1900's gown for my wedding, and it is refreshing to see brides wearing vintage in a modern way! thanks. You would be crazy NOT to wear it :) LOVE it!!! I hope you will write back to ESB with pictures of your day, I would love to see how you decide to work it! It is a gorgeous dress, and I agree with the other ladies: wear your hair loose and messy, not slicked back and/or tight, and go minimal with accessories. I would wear a killer pair of sandals rather than heels or any kind of closed-in shoe.